This unit is engaged in mapping South Africa's vegetation. South Africa's immensely rich flora is also reflected in a wide range of vegetation types. These vegetation types have been identified and mapped, with 440 types described (for South Africa, Lesotho and Swaziland, and the sub-Antarctic Prince Edward Islands). The vegetation map forms a key component of the National Biodiversity Assessment and falls under the auspices of the Biodiversity Research Assessment & Monitoring division of SANBI. The updated map and descriptions are available in the vegetation map on the BGIS website, and in a book, field atlas, CD-set and wall map which are available from the SANBI bookshop and Kirstenbosch bookshop. GIS shapefiles can be downloaded from the BGIS website. The initial media release describes the mapping project which was the result of more than ten years of collaborative effort by various organisations and experts in mapping and describing vegetation for the region. It is fully recognised that the map is not carved in stone and that improvements are needed as well as corrections where necessary. To this end SANBI convenes a committee to receive and assess comments and suggested improvements. Additional descriptive, mapping or photographic materials relating to the vegetation units of the national vegetation map are also received. See below how you can contribute to this project. This is made up of species-plot data collected by various vegetation scientists since as early as 1948, but mostly concentrated over the period 1970 to 2000. Sampling peaked in the 1980s with some 4 300 of the more than 47 000 plots being sampled in 1987 alone. There are over one million records of species in plots. Georeferencing in decimal degrees DD.DDDDD C, or with coordinates specified (e.g. DD°MM'SS"C) where C represents N, S, E or W.
Full citation of publication, report, thesis etc. 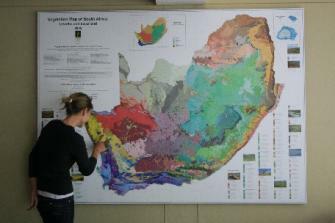 The Vegetation map is a collaborative effort that covers the whole of South Africa, Lesotho and Swaziland. The main implementation work is undertaken at the Kirstenbosch Research Centre. The National Vegetation map and National Vegetation Database are fundamentally important for environmental planning, conservation management, biodiversity assessment and research in the floristically unique region in southern Africa. See links to the vegetation types on the BGIS database. Details of publications are given below. Mucina, L., Rutherford, M.C., Powrie, L.W., van Niekerk, A. & van der Merwe, J.H. (eds), with contributions by 47 others... 2014. 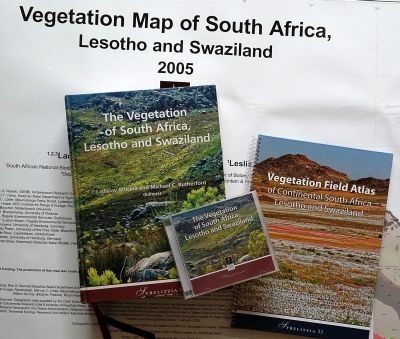 Vegetation Field Atlas of Continental South Africa, Lesotho and Swaziland. Strelitzia 33. South African National Biodiversity Institute, Pretoria. Mucina, L. & Rutherford, M.C. (eds) 2010. (CD Set). The vegetation of South Africa, Lesotho and Swaziland. Strelitzia 19. South African National Biodiversity Institute, Pretoria. Mucina, L., Rutherford, M.C. & Powrie, L.W. (eds) 2007. Vegetation Map of South Africa, Lesotho and Swaziland, edn 2, 1:1 000 000 scale sheet maps. South African National Biodiversity Institute, Pretoria. ISBN 978-1-919976-42-6. These products are available at the SANBI bookshop and Kirstenbosch bookshop. The book includes a CD containing the electronic map and GIS shapefiles, and can also be purchased as a CD set containing one disc with the full text of the book in electronic format and another disc with the electronic map GIS shapefiles (as contained in the book), as a wall map and as a weatherproof Field Atlas of 48 pages. The descriptions of vegetation types in each Biome are given, including a general introduction to each biome, details about how each vegetation type relates to previously published vegetation maps, distribution, vegetation and landscape features, geology and soils, climate, important taxa, bio-geographically important taxa, endemic taxa, conservation, and remarks. The book also includes discussion of vegetation mapping, Biomes and Bioregions and methods used in the study. The book ends with discussion about ecosystem status, protection, vulnerability of vegetation, printed map pages at 1:1 000 000 scale and a glossary. The descriptions of vegetation types and GIS shapefiles are available on the BGIS website. The species lists and reference lists are available for download enabling the user to do things such as search, sort, and summarise the lists as contained in the book. It is important to note that the species lists are not perfect, and feedback will be welcomed to refine them. The updated map shapefile and documents describing new vegetation types are available upon request from vegmap@sanbi.org.za. Some GIS tools are available that were developed in the course of preparing the Vegetation map, and are very useful for continued georeferencing of herbarium and museum specimens, and giving feedback to improve the quality of the vegetation map and other data in SANBI. The vegetation map is the result of a collaborative effort by various organisations and experts. The National Vegetation Map Committee: Mr Andrew Skowno, Ms Anisha Dayaram and Mr Leslie W. Powrie are currently the principal SANBI staff members responsible for convening the committee and implementing approved updates to the national vegetation map. The committee currently includes a range of vegetation experts from various organisations around the country, currently Dr Tony Rebelo (SANBI), Ms Maphale Matlala (SANBI), Dr Hugo Bezuidenhout (Sanparks), Mr Mervyn Lotter (Mpumalanga Tourism & Parks Agency), Prof Ladislav Mucina (University of Western Australia, Perth, Australia), Dr Erwin Sieben (University of the Free State), Dr Philip Desmet (independent environmental research), Prof George Bredenkamp, Mr Simon Todd (SAEON), Mr Clinton Carbutt (Ezemvelo KZN Wildlife), Prof Johann du Preez (University of the Free State) and Dr Coert Geldenhuys (private consultants). The purpose of the committee is to manage the process of peer-review of proposed changes to the National Vegetation Map and/or accompanying descriptions following listed protocols and procedures and to approve proposed changes to the map and/or vegetation unit descriptions. Ms Anisha Dayaram and Mr Leslie W. Powrie are currently the principal staff members responsible for the National Vegetation Database. The NVD is listed on the Global Index of Vegetation Databases that shows that South Africa is ranked number nine in the world in terms of numbers of non-overlapping relevés, some 90% of which are in the NVD. Vegetation mapping in South Africa has developed through the efforts of many people, starting in 1918 with the establishment of the Botanical Survey of the Union of South Africa and work undertaken in the Botanical Research Institute (a predecessor of SANBI), followed by maps of various scales and levels of detail by Pole-Evans in 1936, Adamson in 1938, Acocks in 1953, Low & Rebelo in 1996, and work undertaken by universities and independent vegetation scientists. It was recognised that with improvements in knowledge and technology, and demands for detailed spatial information on natural resources, it was both necessary and possible to produce a spatially detailed vegetation map and descriptions. The present map was formally initiated at a workshop held at Kirstenbosch, Cape Town, in early August 1995 and work commenced by experts in various regions of South Africa. The mapping and publication in 2005 set the basis for vegetation mapping, but the map is being continually refined and improved. There is an approved mechanism in place enabling users of the map and interested contributors to submit to the committee their proposals for changes to the vegetation map. An application form is available from SANBI for submitting changes. Please contact the Vegmap team at SANBI - see our contact details above. We are continually appealing for constructive feedback regarding the vegetation map, and for standardised relevé data for the vegetation database. We also encourage the development of a new generation of vegetation and ecosystem scientists who will carry forward the work of mapping the ecosystems of our country, and surveying the vegetation to enhance our knowledge and understanding of the vegetation of South Africa.